With more than 700 shows across three continents, Amit is one of the best known observational comics in India. He is known as ‘The Married Guy’ in the stand-up comedy circuit. After two kids and one marriage, he realized it couldn’t get any worse and took to comedy. 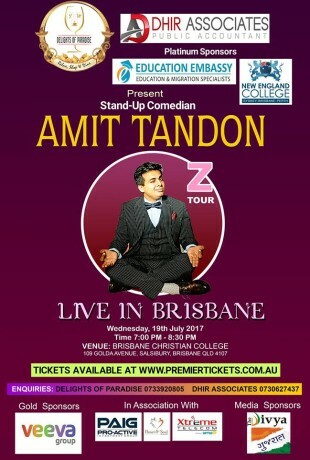 Amit is also the founder of Grandmasters of Comedy, a company focussed on bringing comedy to the corporate world. He is the runner up at CEOs GOT TALENT telecasted on CNBC TV 18. He is also the first comedian featured on NDTV, Rising stars of Comedy. Amit hosted the new year show on Doordarshan and also led the spread the cheer campaign for Comedy Central in Delhi. The Person will be removed from venue immediately if caught doing photography or videography. Premier Tickets is an online event marketing and ticketing agency. Premier Tickets will NOT be responsible for any changes related to the event schedule, artist, venue or cancellation and refunds related to the tickets for Amit Tandon Stand Event.